Here is a link to an interview I gave to a magazine in France. If you can read French, this should be an enjoyable opportunity to practice your fluency. Enjoy. 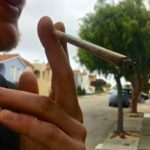 Quest risque a fumer cannabis a San Francisco?